I’m deeply concerned about the health of our planet. I’m also concerned at how much quicker we need to change the way we live and consume on our planet. However, people also need and deserve easier access to make those changes. I couldn’t stand how difficult it was to shop sustainably. We cannot expect people to compromise when it comes to living a more sustainable lifestyle. That’s what inspired me to start. I want to help solve our sustainability problem. 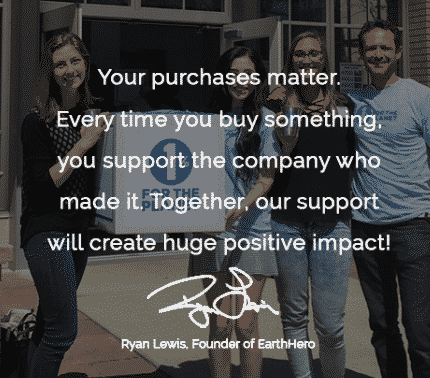 EarthHero exists to make shopping sustainable EASY! In fact, our mission is to make sustainable shopping so easy, everyone does it! We offer a dedicated online marketplace that curates “best-in-class” eco-friendly products across a wide selection of everyday consumer lifestyle categories. We educate, celebrate, and also provide clear, vetted, high quality, eco-friendly brands that make products with the Earth’s best interest in mind. Our planet desperately needs help. A consumption paradigm shift is needed. We need to move away from the materialistic paradigm of “more is better, bigger is better, never enough” to a more mindful approach. One where every time we buy something, we consciously do it. As more people consume sustainably, our planet can begin to heal.